Iconography proofs the existence of a mourning practice in Amarna. Specially relevant is the Royal Tomb, where the funeral of Meketaten, the royal daughter, was depicted. The death of Meketaten was lamented by the royal family, that is Akhenaten, Nefertiti and the three sisters, Meritaton, Ankhesenpaaton and Neferferuaton-ta-sherit, but also by a group of mourners. These scenes of lament in Amarna were sculpted in rooms alfa and gamma and they merit to be observed in more detail. Let’s watch first at the mourning scene in room alfa. Here the scene of lament happens in two registers. 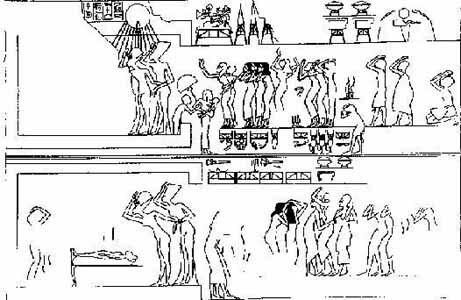 On the left side the corpse of Meketaten is laying on a bed (the image remain just in one), while Akhenaten and Nefertiti cry in front of the body. From the drawing probably this “familiar lament” occurs inside a room. On the right side a group of mourners are depicted in the typical attitude of despair: raising their arms and their faces up, beating their heads, covering their eyes with the hands, and some pretend to fall down while others hold them tight. Detail of the common mourners in the death of Meketaten. Royal Tomb of Amarna. 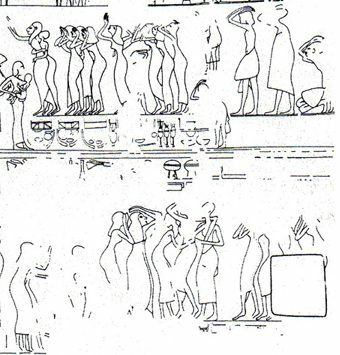 The presence of common mourners in ancient Egyptian funerals is not new. In fact it is usual the scene of lamentation made by common mourners, as for instance in the mastaba of Mereruka. Common mourners in Ancient Egypt remembered the chaos and confusion produced by death. And this disorder was depicted in Egyptian art through the dynamism of their bodies. On the other hand, it is also normal to find them outside the place where the corpse is laying. Because common mourners were a part of the cortege, but they were not involved in the funerary rites in the benefit of the mummy. So this lament in Amarna has nothing exceptional. Because it is not new in the funerary art and practices of Ancient Egypt. Therefore, a group of common mourners crying the death of Meketaten proof that the lament in Amarna existed. Their gestures recreated the chaos, disorder and dark of the death itself, a very typical thought of the religious belief in Ancient Egypt. But, what did the royal family meanwhile do? In the next post we will write about the scene on the left.